This blog post draws on data and research discussed in our entry on Yields and Land Use in Agriculture, and Fertilizers and Pesticides. This post was first published on October 19th 2017, and was extended on December 19th 2017. As the total global population continues to rise and economic growth drives a transition towards more resource-intensive diets, a growing number of consumers are concerned with how to reduce the environmental impact of their dietary choices. Consumers often see organic food as an effective way to reduce their impact: surveys reveal that regardless of geographic location, the primary motivations for organic food purchases are health1 and environmental concerns.2 Furthermore, consumers are often willing to pay more for organic products – some studies indicate a willingness-to-pay of up to 100 percent above standard prices.3 But is this a wise choice? Is going organic really the best way to reduce the environmental impact of our diets? Before we explore the relative impacts of organic vs. conventional agriculture, it is worth clarifying their definitions. Organic agriculture refers to the farming of crops or livestock without the use of synthetic inputs, including synthetic fertilizers, pesticides, plant growth regulators, nanomaterials and genetically-modified organisms (GMOs).4 Note that organic does not necessitate &apos;chemical-free&apos; or &apos;pesticide-free&apos;; chemicals are often used in organic farming, however these cannot be synthetically manufactured, with the exception of a small number which have been approved by the National Organic Standards Board.5 Conventional (sometimes termed &apos;industrial&apos;) farming is therefore any agricultural system which uses one or more of the above synthetic inputs. The methods applied for weed and pest control in conventional and organic systems can also impact on choices of planting and tillage techniques. Conventional farming often utilises synthetic herbicides for the control of weeds; this approach is typically more conducive to low- or no-till management techniques.6 Since herbicide applications cannot be widely adopted in organic farming (with some approved exceptions), options for no-till farming can be more limited and places greater emphasis on approaches such as mechanical controls and/or mulching. In arable farming (which concerns the production of crops), nutrients can be added to the soil in the form of organic matter, such as green compost, animal manure (human sewage sludge is typically prohibited), or bone meal. For livestock, organic methods mean animals must be fed organically-certified feed (or graze on land with no synthetic chemical inputs), and antibiotics cannot be used throughout their lifetime (except in emergency cases such as disease or infection outbreak). In conventional livestock production, there are no constraints on feed certification and antibiotics or growth hormones are often used. Animal welfare standards for organic certification can vary by country, however for many, livestock must be raised with access to the outdoors (i.e. caged hens are not permitted). Conventional livestock farming covers a range of production methods: they can be produced in either &apos;free range&apos; or &apos;caged&apos; conditions. These are typically monitored and labelled as such on product packaging. In this post, we present the empirical evidence comparing organic to conventional agriculture in terms of environmental impact. Despite strong public perception of organic agriculture producing better environmental outcomes, we show that conventional agriculture often performs better on environmental measures including land use, greenhouse gas emissions, and pollution of water bodies. There are, however, some contexts where organic agriculture may be considered appropriate. Organic vs. conventional: what are the relative impacts? Their analysis reviewed relative impacts across the range of food types – cereals, pulses and oilcrops, fruits, vegetables, dairy and eggs, and meat – and across a range of environmental impact categories – greenhouse gas emissions, land use, acidification potential, eutrophication potential, and energy use. &apos;Eutrophication&apos; refers to the over-enrichment or pollution of surface waters with nutrients such as nitrogen & phosphorous. Although eutrophication can also occur naturally, the runoff of fertilizer and manure from agricultural land is a dominant source of nutrients.9 This disaggregation of food types and environmental impacts is important: there is no reason to suggest that the optimal agricultural system for cereal production is the same as for fruits; and there are often trade-offs in terms of environmental impact – one system can prove better in terms of greenhouse gas emissions but higher in land use, for example. Food systems are made up of many phases – ranging from pre-farm activities, crop production, animal feed production, and harvesting, to transportation, distribution, and cooking. To fully and consistently account for the various stages of production, a process called life-cycle analysis (LCA) is used. LCAs attempt to quantify the combined impacts across several stages of production by considering all inputs and outputs in the complete process. The key in comparing LCAs between products is ensuring that the same number of stages of the supply chain are included in all analyses. For this meta-analysis, Clark & Tilman (2017) compared 164 LCAs which account for inputs pre-farm and on-farm (up until the food leaves the farm). The aggregated results of Clark & Tilman’s study is shown in the chart below. This comparison measures the relative impact ratio of organic to conventional agriculture, whereby a value of 1.0 means the impact of both systems are the same; values greater than 1.0 mean the impacts of organic systems are higher (worse) (for example, a value of 2.0 would mean organic impacts were twice as high as conventional); and values less than 1.0 mean conventional systems are worse (a value of 0.5 means conventional impacts are twice as high). We see these relative impacts measured by food type across our range of environmental impacts with averages and standard error ranges shown. 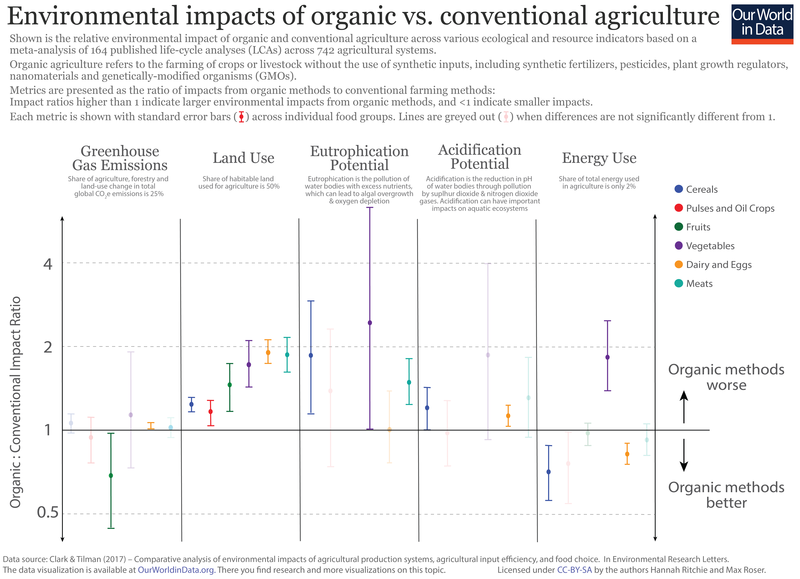 We see large differences in impact patterns across environmental categories and food types. For some impacts, one system is consistently better than the alternative; whilst for others, results are mixed depending on crop type and the local agricultural context. The clearest results are for land and energy use. Organic systems consistently perform worse in terms of land use, regardless of food type. As we explore in detail in our entry on Yield and Land Use in Agriculture, the world has achieved large gains in productivity and gains in yield over the past half-century in particular, largely as a result of the availability and intensification of inputs such as fertilizer and pesticides. As a result, the majority of conventional systems achieve a significantly higher yield as compared to organic systems. Therefore, to produce the same quantity of food, organic systems require a larger land area. This produces the inverse result for energy use. The industrial production of chemical inputs such as fertilizers and pesticides is an energy-intensive process. The absence of synthetic chemical inputs in organic systems therefore means that their energy use is predominantly lower than in intensive conventional agriculture. The exception to this result is vegetables, for which energy use in organic systems tends to be higher. Some of this additional energy use is explained by the use of alternative methods of weed and pest control in organic vegetable farming; a technique widely applied as an alternative to synthetic pesticide application is the use of &apos;propane-fueled flame weeding&apos;.10 The process of propane production and machinery used in its application can add energy costs - especially for vegetable crops. Acidification and eutrophication potential are more mixed, but tend to be higher in organic systems; average values across all food types are higher for organic, although there are likely to be some exceptions in particular contexts. Why are organic systems typically worse in these measures? The supply of nutrients in conventional and organic systems are very different; nitrogen supply in conventional agriculture is supplied with the application of synthetic fertilizers, whereas organic farms source their nitrogen from manure application. The timing of nutrient release in these systems is different: fertilizers release nutrients in response to crop demands, meaning nitrogen is released when required by the crops, whereas nitrogen released from manure is more dependent on environmental conditions, such as weather conditions, soil moisture and temperature. Nutrient-release from manure is therefore not always matched with crop requirements – excess nutrients which are released but not taken up by crops can run off farmland into waterways such as rivers and lakes. As a consequence, the pollution of ecosystems with nutrients from organic farms are often higher than conventional farms, leading to higher eutrophication and acidification potential. Should we treat environmental impacts equally? Organic agriculture proves better for some environmental impacts, and conventional agriculture for others. These trade-offs can make it difficult to decide which we should be choosing. But should we be considering all environmental impacts equally? Should some have higher importance than others? The contribution of AFOLU to acidification and eutrophication is more difficult to quantify, however it is widely considered to be the dominant source of nutrient input to aquatic ecosystems. We might therefore conclude that energy use – the only category in which organic agriculture has a clear advantage – is comparatively substantially less important than other impacts. Is more intensive agriculture always the answer? If we are most concerned with areas of environmental change for which agriculture has the largest impact – namely land use, water pollution, and greenhouse gas emissions – for which conventional agriculture tends to be advantaged, is the answer to make global farming as intensive as possible? Not necessarily. There are several reasons why this view is too simplistic. The impacts quantified here fail to capture another important ecological pressure: biodiversity. Conclusive comparisons of the relative impacts of agricultural systems on biodiversity are still lacking. Biodiversity is affected by a number of agricultural impacts, including pesticide application (which can be toxic to some species), soil erosion, and disruption from land tillage methods, and either habitat destruction or fragmentation.12 Intensive agriculture undoubtedly has severe impacts on local biodiversity.13 A recent study by Hallmann et al. (2017) reports a greater than 75 percent decline in insect populations over the last 27 years; although unclear as to the primary cause of this decline, it&apos;s suggested that pesticide use may be a key contributing factor.14 Organic farming systems also impact biodiversity, but perhaps less dramatically per unit area, due to lower fertilizer and pesticide use. However, as our land-use metrics show: organic agriculture requires far more land than conventional agriculture. This creates a divide in opinion of how best to preserve biodiversity: should we farm intensively over a smaller area (with understanding that biodiversity will be severely affected over this area), or should we farm organically, impacting biodiversity (perhaps less severely) over a much larger area.15 There is no clear consensus on how best to approach this issue. Another point to consider is that conventional agriculture is not necessarily better across all food types. Context, both in terms of the food commodity and the local environment, can be important. For example, if greenhouse gas reduction is our main focus, we might be best off eating organic pulses and fruits, and conventional cereals, vegetables, and animal products, based on the results presented above. The common perception that organic food is by default better, or is an ideal way to reduce environmental impact is a clear misconception. Across several metrics, organic agriculture actually proves to be more harmful for the world&apos;s environment than conventional agriculture. The debate between organic and intensive agriculture advocates is often needlessly polarized. There are scenarios where one system proves better than the other, and vice versa. If I were to advise on where and when to choose one or the other, I’d advise trying to choose organic pulses and fruits, but sticking with non-organic for all other food products (cereals, vegetables, dairy and eggs, and meat). The organic-conventional debate often detracts from other aspects of dietary choices which have greater impact. If looking to reduce the environmental impact of your diet, what you eat can be much more influential than how it is produced. The relative difference in land use and greenhouse gas impacts between organic and conventional systems is typically less than a multiple of two. Compare this to the relative differences in impacts between food types where, as shown in the charts below, the difference in land use and greenhouse gas emissions per unit protein between high-impact meats and low-impact crop types can be more than 100-fold. If your primary concern is whether the potato accompanying your steak is conventionally or organically produced, then your focus is arguably misplaced from the decisions which could have the greatest impact. This is perhaps not a surprising result, considering the use of pesticides is typically higher in conventional agriculture. However, the important question is: should we be concerned about the health impacts of pesticide residues? The World Health Organization (WHO) have established a Joint FAO/WHO Meeting on Pesticide Residues (JMPR) which establishes &apos;safe&apos; intake levels of individual pesticide inputs, where &apos;acceptable daily intakes&apos; are set at levels for which exposure would have no carcinogenic effects on human health. Governments and food governance bodies then use acceptable intake levels to establish Maximum Residue Limits (MRLs). These are enforced by national governing bodies to ensure that consumer food has residue levels which are below such MRLs. Evidence suggests that residue standards and limits are strongly enforced. A US-based study investigated the ten most frequently identified pesticide residues across twelve commodity groups from the United States Department of Agriculture (USDA) Pesticide Data Program (PDP) database.19 The authors searched USDA database results for nationwide residue assessments from 2000 to 2008. All pesticide exposure estimates were found to be well below the defined &apos;chronic reference doses&apos; (RfDs). Only one product had a residue level greater than 1% of the RfDs (and only just, measured in at 2% of RfDs). The majority (75 percent) of commodities measured below 0.01 percent of RfD limits. For context, this means residue levels were one million times lower than the threshold for which there are observable effects to exposure. The focus of this post is the environmental impact of organic and conventional produce rather than its health impacts, however we have summarised some evidence on food safety concerns as a subnote to this article. Yiridoe, E.K., Bonti-Ankomah, S. and Martin, R. C. (2005) Comparison of consumer perceptions and preferences toward organic versus conventionally produced foods: A review and update of the literature, Renewable agriculture and food systems, 20. Available online. Goldman, B. J., & Clancy, K. L. (1991). A survey of organic produce purchases and related attitudes of food cooperative shoppers. American Journal of Alternative Agriculture, 6(2), 89-96. Available online. United States Department for Agriculture (2015). Natural Organic Farming Handbook. Available online. Regulatory organic bodies - such as the National Organic Standards Board - have approved a small number of synthetic pesticides for use in organic farming. The most widely-discussed example of this is copper sulfate, which is often used as a fungicide. Details of the USDA's prohibited and approved substances in organic agriculture can be found here. Huggins, D. R., & Reganold, J. P. (2008). No-till: the quiet revolution. Scientific American, 299(1), 70-77. Available online. This conclusion is perhaps an important result in itself (and as we discuss later); whilst those who lie strongly on either side of the debate present an either-or scenario for organic and conventional agricultural systems, specific context can be important. The conclusion that either system proves to be better in all cases is false. Clark, M., & Tilman, D. (2017). Comparative analysis of environmental impacts of agricultural production systems, agricultural input efficiency, and food choice. Available online. Nutrient additions can cause a major disruption in ecosystem dynamics of water bodies. Species such as phytoplankton and algae thrive on nutrients and can soon overwhelm aquatic habitats. The oxygen they consume in degradation can often lead to low-oxygen 'dead zones', effectively suffocating other aquatic species such as fish. Bos, J. F., de Haan, J., Sukkel, W., & Schils, R. L. (2014). Energy use and greenhouse gas emissions in organic and conventional farming systems in the Netherlands. NJAS-Wageningen Journal of Life Sciences, 68, 61-70. Available online. The mismatch in nutrient release and demand in organic systems, which we described above, means that excess nitrogen can also be converted to nitrous oxide. Ammann, K., & Garden, B. (2004). the impact of agricultural biotechnology on biodiversity a review. Report Botanic Garden, University of Bern. Bern, Switzerland. Available online. Gabriel, D., Sait, S. M., Kunin, W. E., & Benton, T. G. (2013). Food production vs. biodiversity: comparing organic and conventional agriculture. Journal of Applied Ecology, 50(2), 355-364. Available online. Hallmann, C. Sorg, M., Jongejans, E., Siepel, H., Hofland, N., Schwan, H., Stenmans, W., Müller, A., Sumser, H., Hörren, T., Goulson, D. & de Kroon, H. (2017). More than 75 percent decline over 27 years in total flying insect biomass in protected areas. PLoS One. Available online. Ramankutty, N., & Rhemtulla, J. (2012). Can intensive farming save nature?. Frontiers in Ecology and the Environment, 10(9), 455-455. Available online. Baker B P, Benbrook C M, Groth E and Lutz Benbrook K (2002). Pesticide residues in conventional, integrated pest management (IPM)-grown and organic foods: insights from three US data sets Food Additives and Contaminants. 19, 427–46. Available online. Winter, C. K., & Katz, J. M. (2011). Dietary exposure to pesticide residues from commodities alleged to contain the highest contamination levels. Journal of Toxicology, 2011. Available online.